The night was pitch-black save for a scattering of lights on the horizon. Mount Mayon is just above that row of lights, I was told. Yet it was still too dark to make anything out, not even a silhouette, so I pointed my camera in that general direction. Using the edge of the water to guide my composition, I leveled my horizon and set a timed-exposure based on experience. On my third try, the grand old dame popped-out from the evening sky, with its perfect cone in ostentatious display. The sight sent shivers all the way to my toes. It had been a frustrating few days. 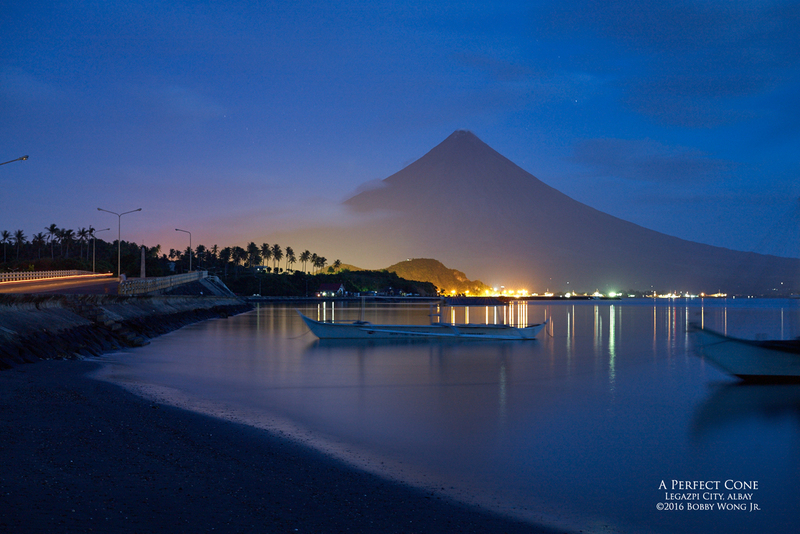 We drove around the base of Mount Mayon in Legazpi City, viewing it at different times of the day, and from different directions, mostly to find it obscured by low flying clouds. That we'd never see it's perfect cone this trip, the thought had crossed our minds more than once. But as in everything else in life, perseverance eventually pays off. And in this case, in spades. Enjoy.